Are you a freelancer? Digital nomad? Side project hustler? Moonlighter? This app was built for you. 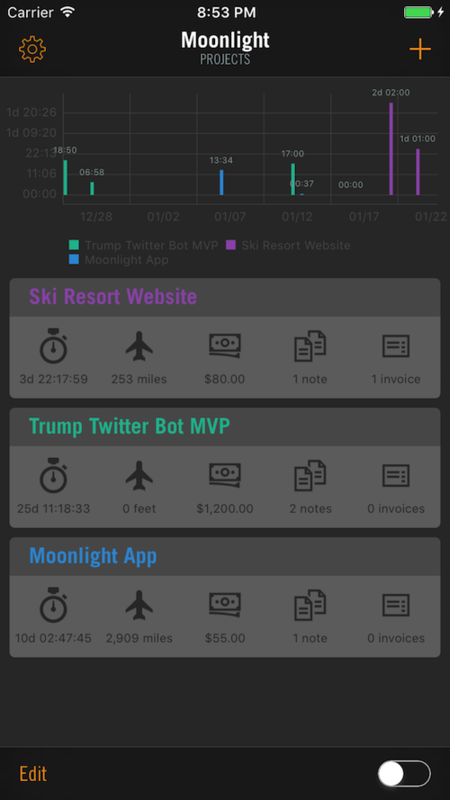 [+] PROJECT TRACKING Moonlight features a comprehensive way to keep track of all of your freelance projects. Track tasks, time, expenses (scan documents), trips (mileage), take notes, and even invoice with Freshbooks integration. Thats just the iOS app. [+] macOS APP We also have a macOS app to track your time straight from the desktop, with realtime sync support. Check it out on the Mac App Store. Everything syncs through iCloud so just make sure you're signed in and let us handle the rest. [+] INVOICE Share invoices and create Freshbooks invoices straight from the app. Spend the 5 minutes you would've spent copy-pasting your invoice items on whatever you want- checking Twitter, Snapchat, even "working" on your soon-to-be-hit personal project. [+] ANALYSIS The home screen of the app shows a graphical analysis of how you spent your time for the past week. [+] EXPORT Easily export your data in csv and json format. That's what Moonlight is all about. Freeing up some free time for freelancers.